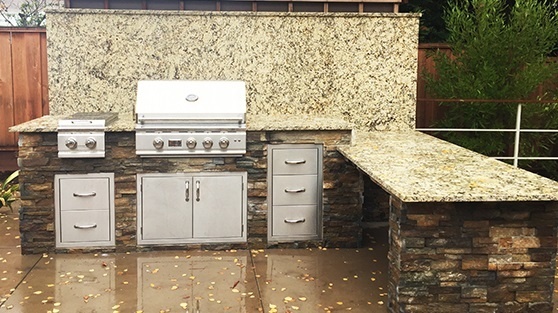 Dreaming of a custom outdoor kitchen for entertaining friends and family? As you’re collecting ideas for what elements you’d like to include, be sure to consider the countertop. Not only is it the surface where you’ll be doing a lot of practical prep work, it’s also one of the features your guests will first notice when they step into your outdoor living space. Choosing a laminated composite countertop (such as Formica) is often an economical choice, and it comes in a variety of colors. However, these man-made materials can be susceptible to denting, fading, or peeling, so you’ll want to be sure to keep your countertop protected during the winter or in extreme weather. Durable and attractive, a tile countertop can give your outdoor kitchen an Old World feel. Not only do you have a world of colors to choose from, but you can also customize the layout patterns. Tile is also on the more affordable end of the spectrum, and is more durable than composite. Grout between tiles may be susceptible to stains, so you’ll want to be sure to have it sealed regularly. You may want to keep it protected during winter months. In addition to looking great on the sides of your outdoor kitchen counter, flagstone is also an attractive countertop material. Flagstone is durable and is perfect for a more rustic or natural feel. Like tile, flagstone needs to be cleaned and sealed regularly, and care should be taken to keep the mortar clean. If you’re going for a contemporary or industrial look, consider a concrete countertop. This durable material is ideal for outdoor construction and can be customized with stamping and other designs. Do be aware that concrete by nature may crack over time. If you have a large countertop, consider including joints (indents or seams that encourage cracking along straight lines), and in case of a rare freeze event, consider covering it to prevent ice damage. Because concrete is porous, it will need to be sealed from time to time. Nothing beats the smooth feel of a finely polished granite countertop. Its reflective gloss and beautiful natural coloration makes it one of the most attractive (albeit one of the most expensive) kitchen countertop options. Granite is stain-resistant and highly durable. Keep in mind that it requires regular sealing to keep it looking beautiful for years to come. Are you ready to make dreams a reality? 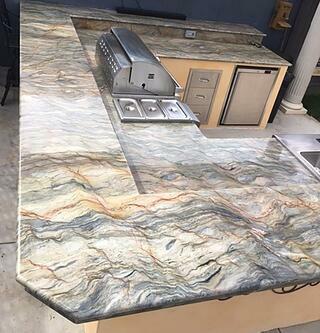 Whether you know exactly which finishes you want for your outdoor kitchen or just have a rough napkin sketch, the designers at Unlimited Outdoor Kitchen can help you create the kitchen of your dreams. We’ll be happy to recommend the countertop material, counter size, appliances and layout that best fit your needs and budget. Give us a call at (888) 7-GRILL-IT or contact us online to get the process started!